The following is taken from the LCG Parents' Guide and summarizes what Dr. Suzuki calls the "Mother Tongue Approach." Much of Dr. Suzuki's success hinges on what he calls the "Mother Tongue" approach to music education. 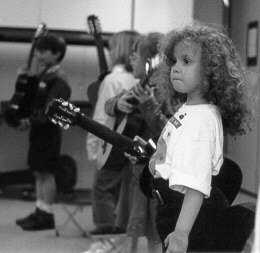 He realized early in his career that young children are able to learn the art of playing beautiful music much the way they are able to master their own language. He was not satisfied with the idea that certain children are born talented but discovered instead that any child, given the proper training and environmental conditions, may develop a high level of ability. Thus, talent is not what we are born with, but something which may be learned. Talent education for the child begins at an early age. It is contingent on listening to the music, practicing with a parent, and performing at every opportunity. The recorded repertoire is played for the child repeatedly throughout the day even before the lessons have formally begun. This method of absorption greatly enhances the educational process. Reading notes with the instrument is postponed until the basic playing technique is mastered. Parental involvement is an essential part of Dr. Suzuki's approach. The parent is considered the "Home Teacher" and is taught the basics of the instrument before the child begins his lessons. The parent carefully observes the child's lessons so that he or she may better assist at home. A positive and supportive atmosphere during the home lesson is strongly encouraged. At home and during the lesson, constant attention is paid to correct posture and proper arm, hand and finger placement. Tonalization, the production of beautiful tone, is continuously stressed. There are numerous opportunities available to the young performer. Small home concerts can provide the incentive to put the finishing touches on a piece of music. In addition to the weekly private lessons, weekly or bimonthly group lessons are held. In these classes students play their pieces together or perform for each other in a mutually supportive atmosphere. The group lessons can foster motivation as the students observes their peers perform more advanced repertoire. The classes provide a social setting for students to share their common musical experiences. Children are also invited to observe the lessons of other students. This can provide fresh perspectives in the understanding of the instrument and the music. The music is standardized and carefully sequenced. Each piece prepares the student for the next. Rather than present the child with a series of dry exercises or manufactured etudes, literature is offered which is not only of high quality but enjoyable to play. Since each piece demands specific technical skills, it should be thoroughly mastered before moving to the next. Review of previously learned repertoire, therefore, is vital to his or her progress. In addition to developing musical sensitivity, frequently listening to the reference recordings greatly aid in motivating the child. His capacity to enjoy practicing correctly at home depends on the ability of the parent and teacher to motivate him. The child is not forced to practice, but is drawn to it by interest which has been carefully fostered. In terms of a child's development, the value of a discipline such as music can never be underestimated. It is not Dr. Suzuki's ultimate goal to create professional musicians, but to enrich a child's life through music.